We live in an era of rapid change, yet little is known about the evolutionary responses of wild plants to environmental perturbations. The resurrection approach is a powerful way to observe evolution in action in the wild, and provide insight into how plant populations evolve in response to stressors such as climate change and invasive species. Dormant ancestors of known age (e.g. seeds from the Project Baseline collection) are reared in a common garden with the contemporary descendants collected from the same site to directly observe evolutionary change over time and examine how it differs across space. How fast is adaptive evolution occurring and can it keep up with climate change? How predictable is evolutionary change in both phenotypic traits and genomic attributes, and to what extent are differences in mating system, life history, dispersal syndrome or ploidy associated with the rate of evolutionary change? How variable are evolutionary rates among populations across the species range? 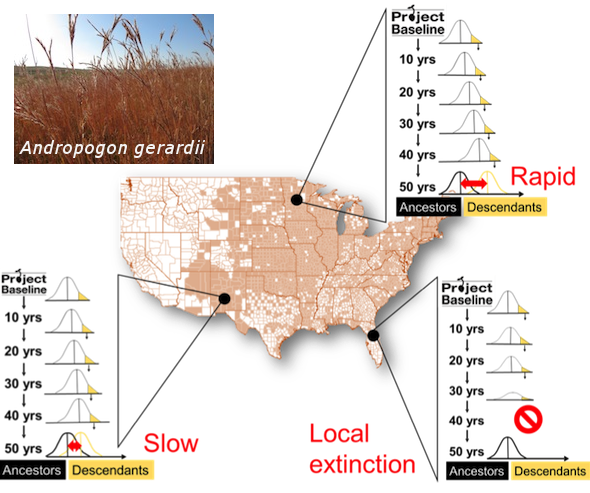 How do reproductive, physiological, or phenological traits evolve in to the context of changes in the length of the growing season, the onset of summer drought, or increased climatic variation? 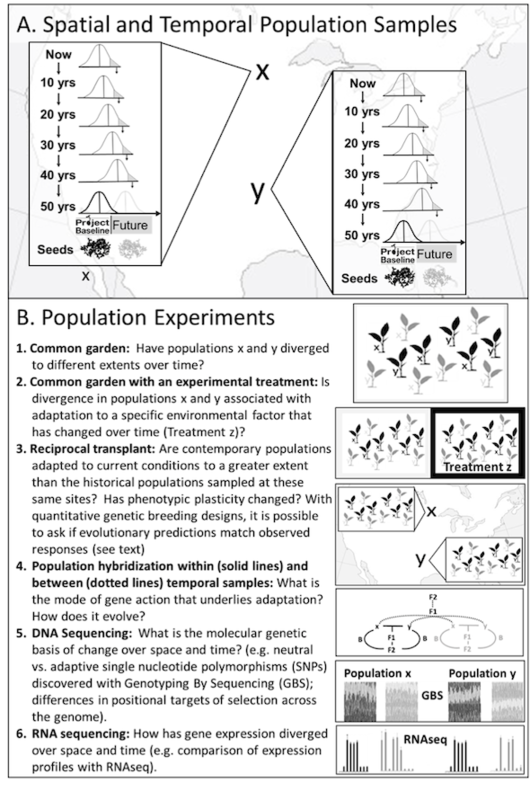 How does the genetic architecture of populations evolve in a rapidly changing environment? Do genomes evolve differently between populations, sister taxa, or different species? What factors are most strongly associated with declines in population performance, abundance, and fitness? Project Baseline collections are designed to maintain the genetic structure of populations within samples to be most useful to researchers utilizing the resurrection approach. Seeds are collected and stored separately by maternal plant from up to 200 individuals per population. After collection, seeds are cleaned and shipped to the USDA National Center for Genetic Resources Preservation for long-term storage. In addition to the seeds collected by maternal plant, approximately 300 bulk seeds are collected from at least 30 random individuals for testing viability and the effects of long-term storage on genetic structure of samples at NCGRP.